Apple computers running macOS version 10.11 (El Capitan) or newer. PCs running Ubuntu Linux version 14 or newer. PCs running Debian Linux or other Linux distributions derived from Debian (e.g. Mint). PCs running Windows 7 or newer. Distribution packages for the releases may be found at the PATRIC github release site. The installation details differ between the major operating systems. We will discuss each in turn. 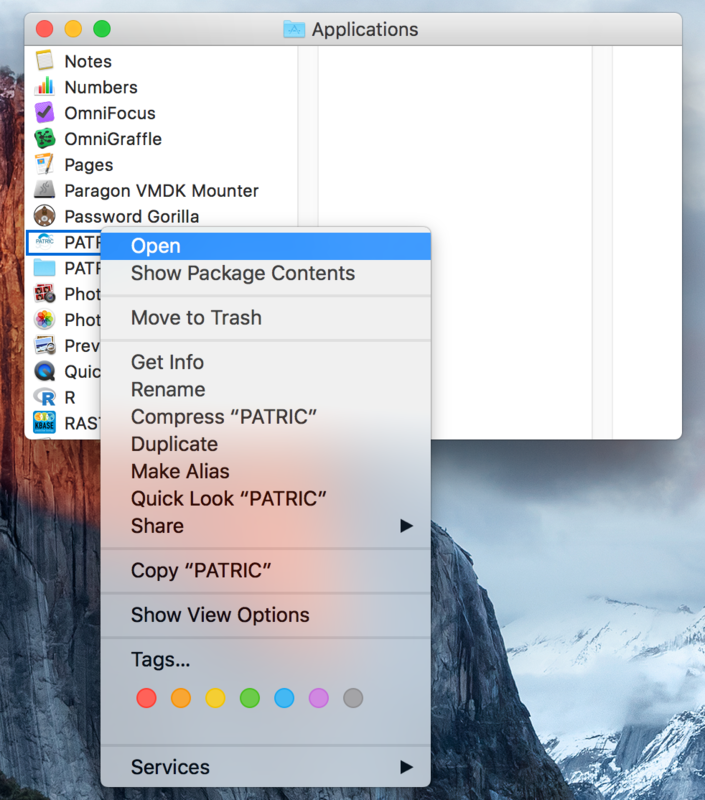 The macOS version of the PATRIC command line interface is distributed as a disk image file. We recommend downloading the most recent version listed at the PATRIC github release site. Download the release disk image file by clicking on the link named PATRIC-<version>.dmg. Your browser will begin the download and save the file to your downloads directory. If you are using Safari, the download may be found by clicking on the download status icon near the top right of window, or by going to the View menu and clicking “Show Downloads. 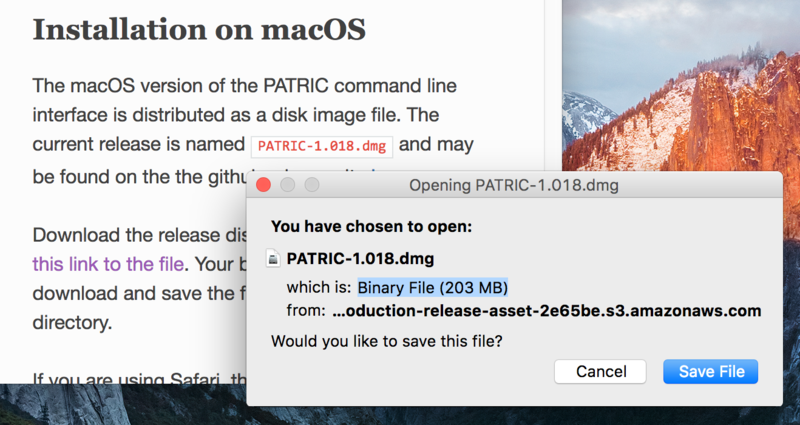 When the download is complete (depending on your internet speed it may take several minutes since the disk image is 200 megabytes in size), open the image by clicking on the downloaded file PATRIC-1.018.dmg. 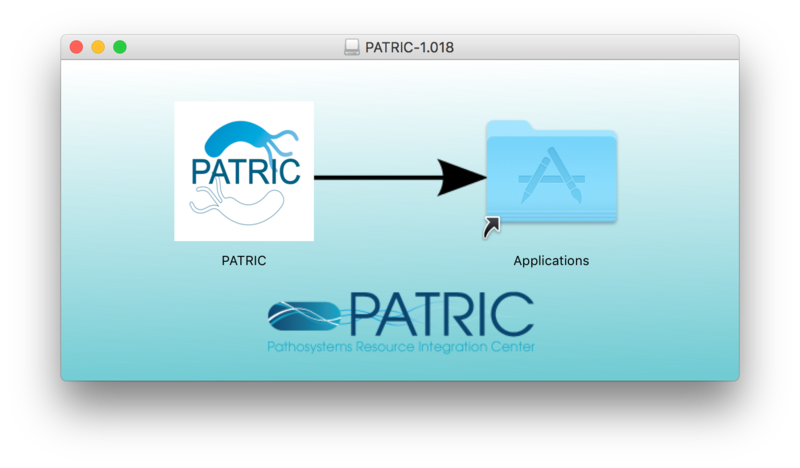 To install the distribution, drag the PATRIC icon onto the Applications icon. This will copy the PATRIC distribution into the Applications folder on your computer. Select “Replace” to replace your existing installation with the new one. Bring up a Finder window showing the Applications folder. You can do this by clicking the desktop background to bring Finder to the front, and selecting the Go menu and choosing Applications. To start PATRIC the first time, you will need to start it in a way that is a little clumsy. 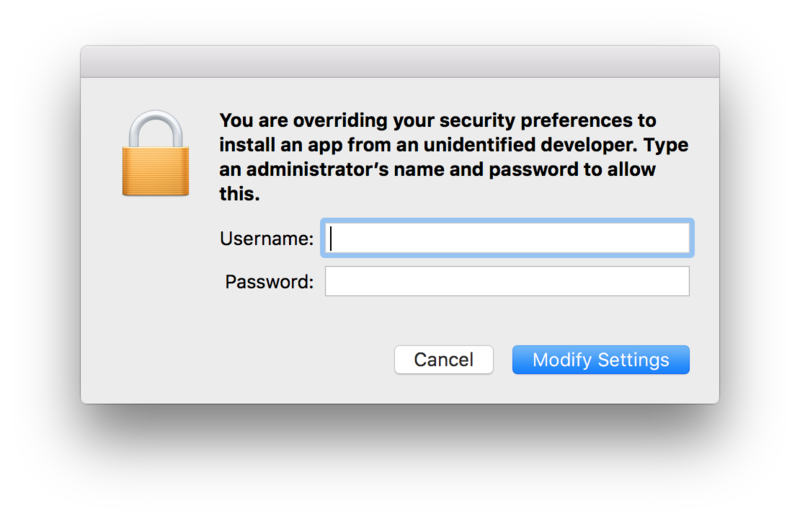 This is due to the security mechanisms in macOS that protect users from unguarded downloads of applications from the Internet. The version of the PATRIC command line interface packaged for Debian Linu and its derivative distributions (Ubuntu, Mint, etc) is provided as a Debian .deb distribution file. The release is named patric-cli-<version>.deb and may be found on the PATRIC github release site. 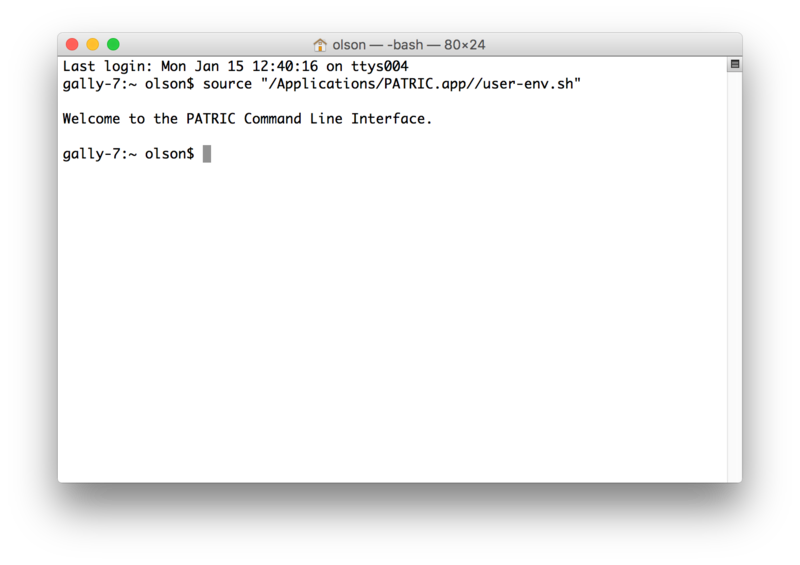 When the install has completed, the PATRIC command line tools will be available for you to use. They are installed in the system binary directory /usr/bin which is accessible in your default environment. 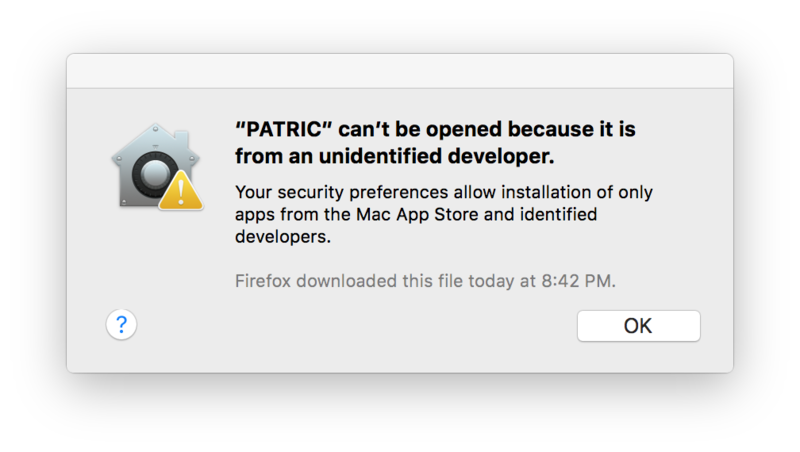 The macOS version of the PATRIC command line interface is distributed as a Windows installation package. The release is named PATRIC-<version>.exe and may be found on PATRIC github release site. 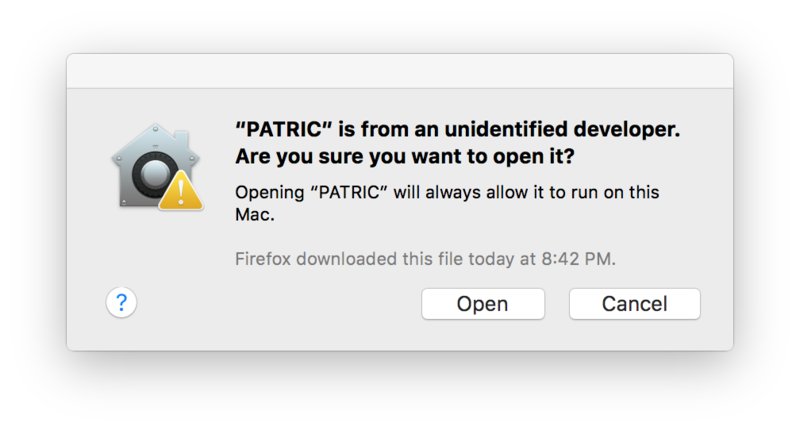 Download the PATRIC installer file by clicking on the link named PATRIC-<version>.exe. Your browser will begin the download and save the file to your downloads directory. Start the installer by doubleclicking the downloaded file. This will start the installation process. You should be able to take the defaults for all of the options. When the installation has completed, you may start a PATRIC command line window by going to the Start Menu, select All Programs, and then PATRIC.